You must make reservations at least 5 minutes in advance of the time at Peacock Restaurant & Lounge at The Inn at 202 Dover. Dinner: Thursday - Monday: 5:30pm Special dinner parties and luncheons upon request. There are no parking restrictions in and around the inn. There is ample convenient street parking. There is no public transportation in Easton. Chef Lloyd brings in the freshest in local produce and entrees for a unique and creative menu for our guests. We are changing our menu weekly and sometimes daily so please call for our most current offerings. For private events we are happy to transform Peacock into your own private venue and Chef Lloyd will help customize your perfect menu that guest will never forget. We have special wine dinners approximately 6 times a year. Our chef prepares a special 5 course dinner to compliment the selected wines and a representative from the vineyard or wine distributor talk about the wines and the pairings. We are happy to discuss your particular requirements and provide you with cuisine that will be quite memorable. Our conservatory is designed for small private parties, up to twelve diners. We are happy to prepare a sampling of cuisine or create a special menu for your private function. We have provided small parties for doctors, executive committee meetings, board of director meetings, strategic planning meetings, pharmaceutical companies, weddings, attorneys, rehearsal dinners, bridal teas, baby showers...just about anything you think of. Peacock Lounge is famous for our casual, yet award wining fine dining experience Selected as Top 11 Romantic Restaurant in America. AAA 4 Diamond and Michelin Recommended. You will probably be welcomed by a member of our fine team of hospitality specialist, offered an opportunity to start your experience with a cocktail or glass of wine in our lounge or, if you prefer, be seated upon arrival. Focusing on the freshest local produce and entrees - Chef Jordan Lloyd creates a unique and creative menu. Known for our house-made sweet potato rolls and pastas, and seasonally inspired soups, entrees (such as prime rib, local rock-fish) and of course home made desserts. We are the only AAA Four Diamond in the state of Maryland for Inns of our size. Easter brunch was great! I will be returning soon for dinner. It was my wife's birthday. I asked Chef Lloyd to craft a very special menu....he hit it out of the park! Pickled duck eggs to start, a splendid potato and ramp soup, roasted foie gras, scallops with a curry crust and then tenderloin of beef. All locally sourced, pedigreed story food...i.e. ingredients raised, grown or caught by humans with a commitment to sustainable and organic practices. As fine a meal as the best NY or Paris has to offer. Our dinner was impressive. The food is wonderful and the flavors are amazing. The dining room is lovely and we totally enjoyed our meal. As a special treat, the new GM is also an opera singer and he sang Happy Birthday and a few other songs. He has a beautiful voice. The only challenge had to do with the service. The wait staff could use some training in terms of timing and how best to chat with customers. We understand that the Inn is under new management (it's only been a month) and great things are planned. We will be back. Superb food, great but not overbearing attention by wait staff. Jason was great to speak with. Definitely a special occasion spot. The rest. week menu was deelish! Chef Jordon Lloyd is in the house! Thank God he's cooking in Easton again. The new owners of 202 Dover now have a wizard in the kitchen to complement their elegant Inn. Sublime food and he's only been there a week. The menu is quite limited--4 entrees the night we were there. But the food was very well prepared, they have a fully stocked bar and the wine list was good. The restaurant is quite attractive but it was very quiet when we were there. it is definitely worth going to. What a fabulous treat! Gorgeous Inn, lovely dining room staff and food divine. Now bear in mind that the chef, Jordan Lloyd, NEVER disappoints and I am so pleased he’s back! It’s not your ordinary weeknight meal out but sooooo worth it. Great dinner. So excited to have Chef Lloyd back in Easton! He really sets the bar for culinary excellence on the Eastern Shore. Built in 1878, this is a beautifully restored mansion and Inn in Easton, MD. We were greeted and seated by Dave our server, and Chef Chris came out to say hello and tell us about the menu. Several items are locally sourced. Dave made a great Manhattan should that be of interest. Our food was delicious as were the deserts. Our hosts went above and beyond to ensure our evening was an enjoyable experience. We look forward to returning in the future. Excellent experience. It's great to have Chef Jordan back in a new venue that matches Bartlett Pear Inn. Let's hope that his many admirers follow him to the Peacock. We came to enjoy Chef Jordan Lloyd’s cooking. It was superb. By the way, Peacock is even more beautiful than we remembered. Perhaps they have updated the decor? Really spectacular. The food and service were exemplary. The staff were friendly and welcoming. The ambiance was beautiful. The lighting was just right and it was quiet. Tables were spaced far enough apart so that one could have a private intimate conversation. I was here for the Valentine’s Day weekend and ordered from their Valentine’s Day Prix Fix 3 course menu. The meal began with an amuse bouche of smoked salmon. It was delicious. I ordered the Oysters Rockefeller, which was served on a bed of seaweed. It was very tasty. Next came the duck breast with couscous and it was excellent. For dessert, I had the chocolate soufflé with crème anglaise that was hand poured by the server at the table. It was excellent. For wine, I ordered a bottle of their Riesling from Alsace, which had just the right balance of fruitiness and acidity. It was very reasonably priced. I highly recommend the Peacock Restaurant and Lounge for a special occasion for a small group of people. While I did not stay in one of the rooms at the Inn, I was given a tour of their French room and it was very beautiful. The bath had a jacuzzi and was luxurious, as was the rest of the room. It would make for a great place to stay. Overall the experience was great! The service was amiable, eager to please, but it was Valentine's Day and very busy and some of the staff appeared to be unused to the routine at this establishment. Also the executive chef, Jordan Lloyd, who is excellent and well known had just taken over the kitchen here and had not the opportunity to make his imprint on the service. I have no doubt that this restaurant will be 5 stars all the way through very soon. Had a lovely celebration of a friend's birthday on a Saturday night. Food was great and Robert, our server, could not have been more attentive and respectful of our talking. We're already planning a return visit! Fabulous New Year's Eve dinner! A great way to ring in 2019. The dinner was wonderful and the service impeccable. Robert was perfect. Food and wine were superb. Thanks for an extremely agreeable meal. When we return to your area count on us again. Six of us enjoyed the Thanksgiving buffet. The food was fantastic! The service was friendly and efficient. The owners greeted us warmly. We ended up having an extra person (our reservation was for 5) and they seamlessly added another place. Very elegant and yet hospitable. I'm looking forward to returning to try the regular menu! We had dinner for Thanksgiving!! Very well organized buffet. Greeting, service and food were excellent! The Peacock Restaurant & Lounge was absolutely wonderful! Everything about our dining experience was exceptional. The beautiful historic home with its elegant and lovely appointments enhanced the setting for our dinner (the background music contributed to the ambiance). The host and owner, Mr. MItchell, was very pleasant, warm, and welcoming. We appreciated the fact he has tasted and therefore has knowledge of all of the wines served and we relied on his recommendation. Our waiter was an excellent representative for the customer service provided by the Restaurant. He was responsive while also focused on facilitating a leisurely, relaxing meal. He was assisted by a very lovely, pleasant woman. Finally, kudos to the chef. The meal was fabulous including our salmon which was cooked perfectly culminating in delicious desserts. This was a return visit and we will be back. We need to plan a weekend where we can enjoy the lovely accommodations. Wonderful experience. From the waitress to the food presentation and taste to the quaint Victorian environment, everything was presented maticulously. The proprietor was kind and welcoming, coming to each table to assure customer satisfaction. Will definitely return when in the Chesapeake. To put it simply, we were disappointed. We walked through the door and there was no one to greet us. We saw two people staring at us from the kitchen but no one came up and greeted us initially. We went to the lounge, which I intentionally arrived early in order to spend time in, but felt mislead when it was basically a sitting parlor. We were offered drinks but no wine list - so we ordered "off the cuff." And just as our drinks arrived, we were told our table was ready. The menu was fine - nice selection, and the waiter shared the additional specials. When we began to place our order, we were told that one of the items was no longer available. That just shouldn't happen on a Saturday night, mid evening. We made second choices and went on with our evening. Maybe my expectations are too high, but when I'm paying for a high end meal, I expect service, food and ambiance to be perfect. I won't be returning. Lovely evening with fabulous food and impeccable service. We were one of only 2 couples in the restaurant. We were there for a dinner to celebrate our wedding anniversary. It was very high class and our waiter was exceptional. After dinner we met the owner he was gracious enough to take us on our own private tour of the inn. Ron Mitchell owns and operates this wonderful restaurant in a beautiful old home in Easton, MD. 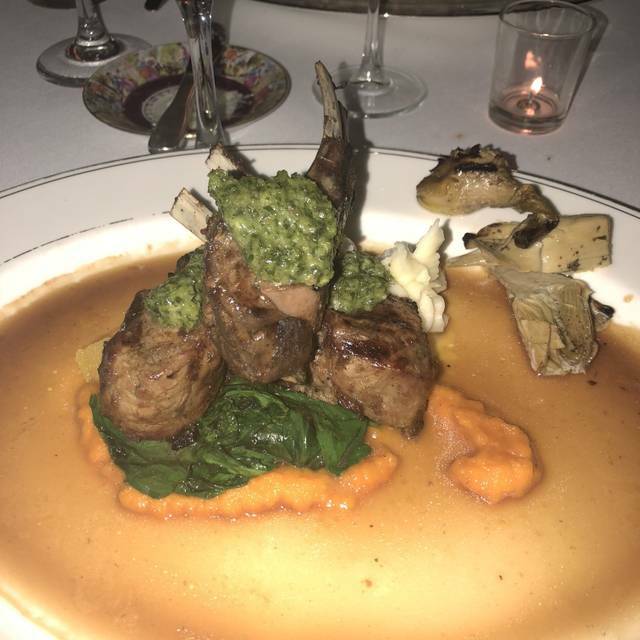 It is upscale, quiet, excellent service, great wine list (Ron will help you find a great wine to have with your meal), the chef is flexible...in short l, it’s a great venue for a really nice meal in a nice setting where you can have a quiet conversation and celebrate a special occasion. They made a gluten-free birthday cake for my girlfriend (now my fiancée as we got engaged at the restaurant that night) that was delicious, gorgeous, and decadently chocolate. It’s on the expensive side but we’ll worth it. Best of luck and thank you again Ron. My wife and I celebrated our 25th wedding anniversary and the evening, service and food could not have been better. I have dined at the Peacock Restaurant a few times however this last visit reminded me that I need to return sooner and with more frequency. One of the best restaurants, IMO, on the Eastern Shore. This is the very best restaurant in Easton and Talbot County for excellent classical cuisine in an elegant dining setting. Prices are quite reasonable given the quality of the dining experience. The menu varies with innovative and tasty seasonal entrées, all excellently preprepared and presented. A good selection of interesting American and French wines at all price points. The staff is well trained and attentive to every detail. Spoil yourself and your guests at this magnificent restaurant in an impeccably restored beau-arts mansion from Easton's historic past . The Peacock was wonderful from the moment we entered the restaurant from the attentive waiter, special martinis, the elegant food including beautiful and delicious first courses, the special entree of wild boar cooked perfectly, and an entree of squid ink negra linguine with perfectly seared scallops and sauteed spinach. White table cloths, exquisite food presentation, exceptional staff and a visit from the the chef to our table all made our dinner that evening quite special. Next time that we are in Easton we will also try to stay the night at the Inn at 202 Dover where the Peacock Restaurant is. The food was excellent, servers great, service a bit slow, perhaps somewhat overpriced. The meal and service were excellent! First time dining here and all the other 5 star reviews were right on. Our appetizer, entree, and dessert all were just fabulous. We were in town for the weekend and chose the Peacock Restaurant from Open Table and were so happy we did! The food, service and ambiance were all top notch. Ron, the owner chose a wonderful white wine to accompany our crab dishes. The wine was not something we would have normally picked. We had a wonderful evening. Outstanding food and service. Highly recommended, as much for the cooking as for the ambience and the conversation with the proprietor! The food was outstanding. The soft crabs were great. The steak was excellent.